Andrew Judge has been working on an indigenous foods garden in Cambridge since the summer and has recently received a grant to expand it, which incorporates the Cambridge Self Help Food bank and RARE Charitable Research Reserve. An Indigenous foods garden in Cambridge, Ont. is broadening its field and yield by joining the Cambridge Self Help Food Bank's community food garden. 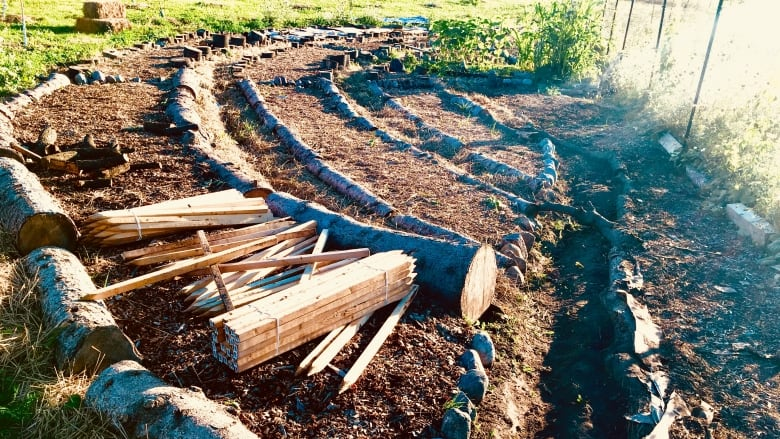 Andrew Judge, co-ordinator of Indigenous studies at Conestoga College, has been building the garden at the Rare Charitable Research Reserve since the summer, in an area close to the food bank's community orchard. Judge's Indigenous garden now incorporates the orchard, which includes over 70 fruit trees. "I wanted to plant Indigenous foods, I started that and [the food bank] had seen the promise in that and now we're all working together," Judge told The Morning Edition. Siobhan Bonisteel, the food procurement and food development manager with the Cambridge Self Help Food Bank, worked with Judge to expand the Indigenous foods garden. She says it was a good opportunity for the food bank to increase the amount of fresh food it gathers and simultaneously help support Indigenous communities in Waterloo region. "The food bank and Rare is committed to doing some really meaningful work around truth and reconciliation," she told CBC News. "Indigenous food is a really wonderful underutilized, undervalued resource that the community should support. Judge hopes to grow a number of different fruits and vegetables that are traditional to the Hodinoshoni, such as corn beans, squash and sunflowers. "Those will be accented by some of our traditional medicine," Judge said. He also hopes to grow wild plums, Saskatoon berries, artichokes, strawberries and raspberries. The food grown at the Indigenous garden will be collected by the Cambridge Self Help Food Bank and go toward their meal programs. Adding more fresh products to the food bank's meal ingredients will help improve nutrition, Judge believes. Local Indigenous groups White Owl and Healing of the Seven Generations have also teamed up with Judge and the Cambridge Self Help Food Bank for the development of new programs. "We want to create space for Indigenous community members, who may not otherwise have the opportunity, to work on the land, to plant seeds, expand the space to provide not just for themselves but for the next generation," Judge said.